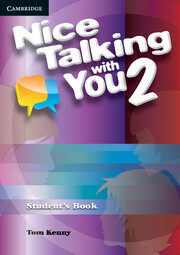 Nice Talking with You Level 2 is designed for elementary and pre-intermediate students. It contains 12 topic-based units and two review units. Topics in Level 2 relate to the equivalent units in Level 1, and include Going out, Fashion, Learning, Experience abroad, Health, and Careers. Practical conversation strategies are introduced in each unit and recycled in later units. Examples of strategies featured in Nice Talking with You Level 2 are: introducing a new idea; making, accepting and declining invitations; changing the focus of a topic; and making an inference.